I have had a few queries about the original Excel spreadsheet that I created to generate my precise dado table (the one with 3000 or so combinations). I have attached it, but here is the disclaimer: it is nowhere as neat as Excel spreadsheets can be, but this was the easiest way I could make it to deal with the number of combinations. Someone familiar with the latest versions of Excel would be able to do a much better job, but I haven’t used it since the XLSX format came out, so there have been a lot of changes since the last time I did use it. Column C: Whether or not the 1/16″ chipper blade is included. Column D – G: The number and size of the various shims included in the stack. Column H: This is the theoretical width. Add to this the additional width that is created by the runout of the saw and blades. This is easily achieved by setting up a basic stack, with the theoretical thickness from the spreadsheet. 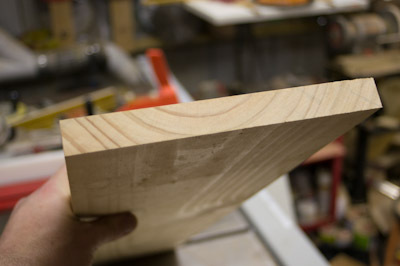 Make a dado cut, and measure the actual width. The difference is caused by the combination of runout from the various blades, and the saw. Column I: This is the runout. At this stage I only have calculated the runout for one setup. If you wanted to be even more exact, you could calculate the runout for each blade the same way, and amend column I accordingly. Column J: This is the money column – the final size of the stack that is built. Column K – Q: These are the calculating columns – leave these alone. Columns R – X: Input each of the widths of the various blades and shims. As I said: it is not the most eloquent spreadsheet. But it works, for me at least! The blade is an 80 tooth, 10″ (250mm), with a 5/8″ bore. That is what suits my saw, they also have 30mm bore, and sizes from 200 – 400mm diameter. It has 4 straight expansion slots to minimise heat distortion, with copper plugs. The copper plugs are used as a vibration absorption, and to block up the holes at the end of the expansion slots – both of which in turn decreases operational noise. The holes themselves are used as a crack-arrestor as they reduce the stress at the end of each slot. The straighter the blade, (in how it is manufactured, in how accurate the teeth are ground, and the less warping/distortion caused by heat), the better the cut. This combined with a tooth profile especially designed for melamine results is a remarkable cut. 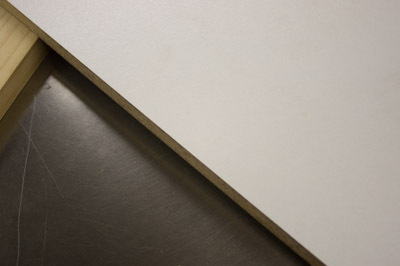 The edge, on both sides of the melamine, is as clean in closeup as it appears in the above-photo. It is a beautiful cut, and that aptly demonstrates the quality of the blade. Getting this sort of result on both the top and underside of the cut is remarkable, and takes a special blade to achieve this. 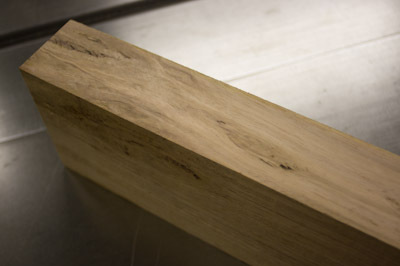 The blade is also very good for crosscutting, whether that be soft or hardwood. The finish is near shiny, and showed negligible to no breakout of fibres at the back of the cut. Ripping was harder – being an 80 tooth blade there is only a small gullet between teeth, and where that is fine for crosscutting, is insufficient for clearing waste and the long fibres created during a rip cut. It is still achievable, but you have to cut slow (risking burning the timber, overheating and distortion in the blade). Even so, a shiny cut was the result! Good enough to go straight to a finish, or one final light sand. The blade is finished with a new process, called electro-bluing. It is a smooth coating for the blade, replacing the teflon-like finishes of other blades. It has only been available since September 2012! This micron-thin coating is claimed to reduce heat buildup, and the accumulation of resin. The coating includes the teeth of the blade. It will be very interesting to see how durable the coating is! It is also promoted as being an environmentally friendly coating. If that is a feature you need, this blade (and this coating) offers that, which differs from many other, more traditional coatings. 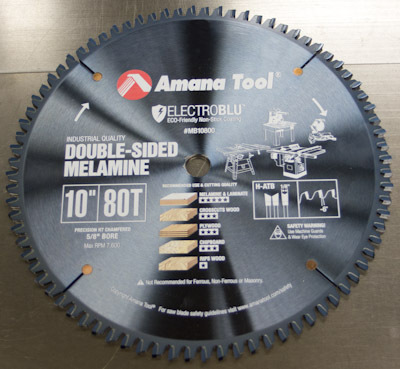 A blade designed to cut double sided melamine, by Amana Tool. Ever gone to purchase a sawblade and wondered just what all the codes are engraved on the side (or printed on the packaging)? There are a surprising number of variables that are possible with saw blades, so many versions that can be considered. Some are irrelevant when choosing between one blade and another – they distinguish between a blade suitable for wood vs plastic (for example). Some blades do cross over – the Flai Mustang for example, which will have variables that suit both materials. ATB = alternating top bevel – this blade has its teeth set so it is like a chisel, with one tooth cutting to the left, and the next to the right of the kerf. You could have 4+1 (4 ATB teeth, plus one FT (flat tooth) as a raker tooth, flattening the bottom of the cut). An ATB blade leaves a V groove in the bottom of a partial-depth cut, and the 4+1 is a way to resolve this, leaving a flat-bottomed kerf. This is the kerf of the blade, measuring across the teeth. This does not mean the blade will actually cut a 3.0mm wide kerf however. Blades have runout (just how flat is the blade, and during use just how flat it remains as the temperature of the blade changes). Saws (tablesaws or circular saws) also have runout, and it is a combination of both that will dictate exactly how wide a kerf you will get. If you want to know it exactly each time, you have to measure it whenever you change blades. The next time you mount the same blade, it could be different depending on at what point of rotation that the saw is vs the blade. 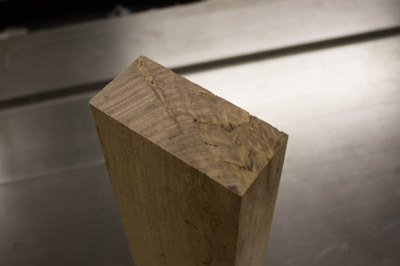 It is much easier just to do a test cut and remeasure if it is that important. This concept is greatly (and deliberately exasperated) for a wobble dado blade, which is designed with a large amount of runout which can be dialed in, creating a dado (or wide trench). This is the size of the bore – the hole through the middle of the blade. Depending on your saw you can either get a blade that specifically matches your saw, or one that is larger and get some saw blade bushes (or reducers) to match both the blade and you particular saw. They are not as convenient (but are still easy to use), and they allow you to purchase blades that are suited to your needs without necessarily being made for the size bore you require. Of course, if the hole is smaller than your arbor, you have a problem! Getting back to dado blades for a sec, when using stacked dados, I would strongly recommend getting one where the bore is correct for your saw – there are enough things to juggle without also having to try and manage a bunch of bushes as well. Z stands for the number of teeth. A ripping blade can have around at little as 24 teeth, a crosscut blade as many as 100. H is the hook angle (or rake angle). Large hook angles are an aggressive blade, particularly for ripping soft timbers. Small, zero or even slightly negative for crosscutting hard timbers. These are just some of the variables and codes that can be written (engraved) onto the blade. They may not all be listed, and some blades may list a whole bunch more. If you know these at least, you are well on your way of being able to distinguish between one blade and the next. Some other variables include top clearance angle, top bevel angle, gullet size, gullet plug, expansion joints, noise reduction slots, max operation RPM, carbide type, base blade material, blade coating, body thickness and so on. We’ll stick with the most common concerns at this stage! 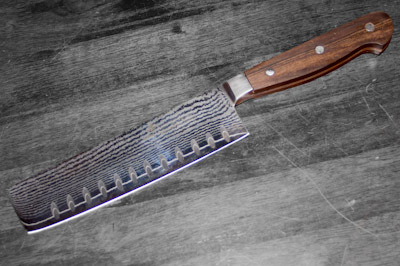 I recently wrote about Damascus Steel, and showed this knife from Professional Woodworkers Supplies as an example of a modern interpretation of this traditional steel-making technique. Over the weekend, I had a chance to complete the handle for this knife, so I was able to put it to use! I started, as always, scrounging around through my timber stocks, looking for just the right piece of timber for the job. Not sure which is the more rewarding: having a project and the excitement/anticipation of the project commencement while out sourcing and purchasing just the right pieces of timber for the job, or scrounging around your own existing timber store, though pieces collected over the years and waiting for just the right project to come along to be able to finally do it justice. For this project I looked at many pieces and different species. Even tried a couple to see if there was enough detail for the project at hand, but rejected them in the end. 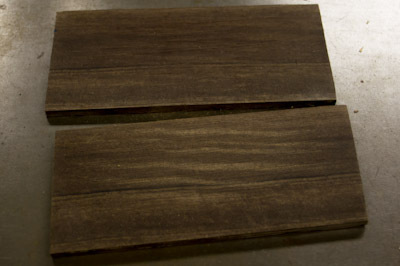 I finally had a look at the pack of Queen Ebony strips I had purchased at a wood show a few years ago, and suddenly realised that the bottom two strips (about 1.5m long each) were thicker than the others, and were in fact thick enough for this project, even after being machined flat! This is a perfect scenario – it gives me a chance to actually machine one face smooth and flat, and then match the opposite side and still end up with timber thick enough for the task at hand. The project is pretty straight forward, and follows the steps I took when doing the steak knives. After sizing the scales, they were double-sided taped together (carpet tape). These were then stuck to one side of the blade. On the drill press, holes where then drilled through the holes in the knife blank, then while still attached to the blade, the whole lot were transferred to the bandsaw, and the rough outline of the blade handle cut. The scales were then separated, glued (epoxy) to either side of the blade blank, and the rivets inserted. Once the glue was dry, the whole contraption was transferred to the spindle sander for the final shaping. To complete, the Festool ETS 150/5 was used to polish the sides and edges. The Queen Ebony really looks the part – I am most impressed! 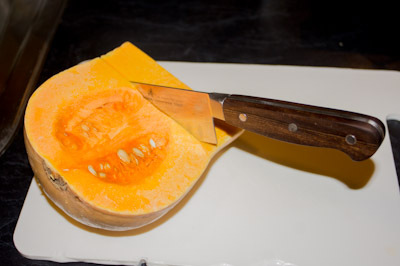 Finally, the real test is in the kitchen, so I gave a piece of pumpkin a workout. The final verdict is in the use, and this knife handled beautifully! 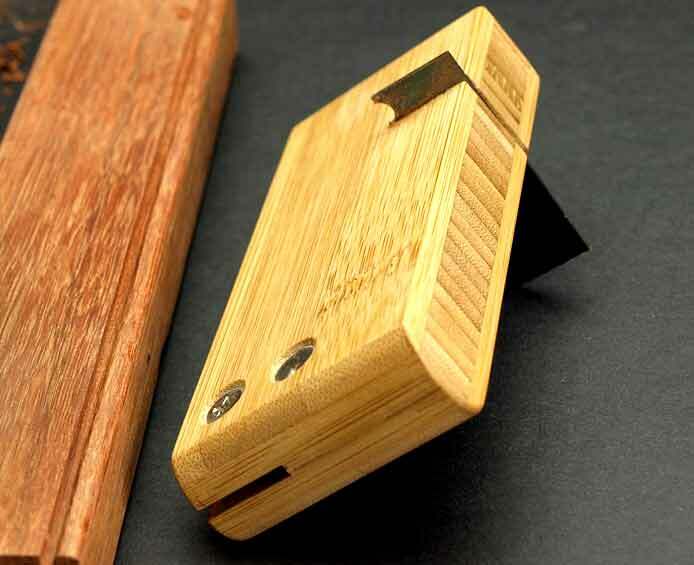 The sharpness of the blade, the scalloped blade and a home-made stunning handle. A fun little project, and a very satisfying result!